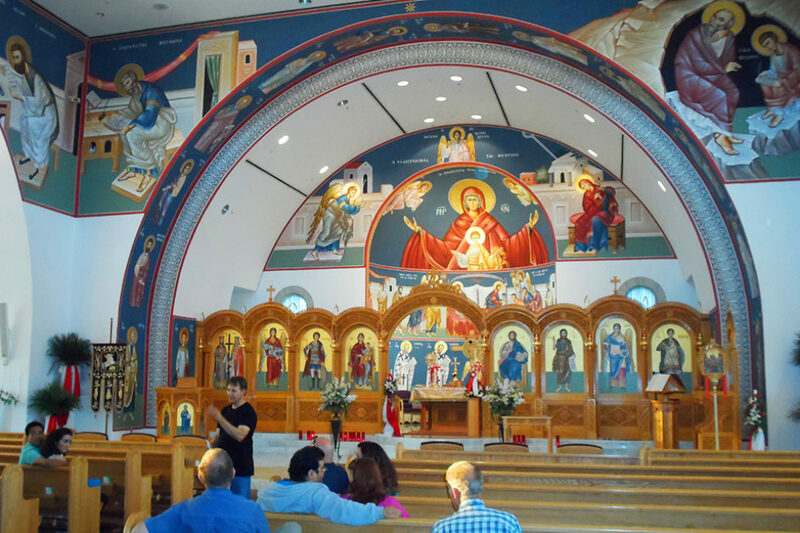 Greek Orthodox Christians have lived in Downey since the 1950s and attended other Greek Orthodox Churches in the area. In 1982 it was determined that enough families expressed an interest in establishing a Greek Orthodox Church in Downey. The parish first worshiped in spaces rented from St. Mark’s Episcopal Church several blocks north of the Church’s present location on Downey Avenue. In 1995 the parish purchased the present property on Downey Avenue and renovated several vacant stores on the site into a Chapel and fellowship hall. Ground breaking for the new sanctuary was held in September 2000. In March 2001 construction began and completed in September 2002. Fr. John Constantine was appointed as the parish Priest in June 2001 as the third priest in the history of St George. The Doors of Saint George were opened on October 6, 2002 by the late Metropolitan Anthony of San Francisco assisted by His Grace Bishop Anthimos of Olympos, to the overwhelming joy of the parishioners of Saint George. A dream long in the making of having their own permanent house of worship! The Greek Community in Downey shares its cultural and ethnic heritage with the annual Greek Festival held in June of each year.